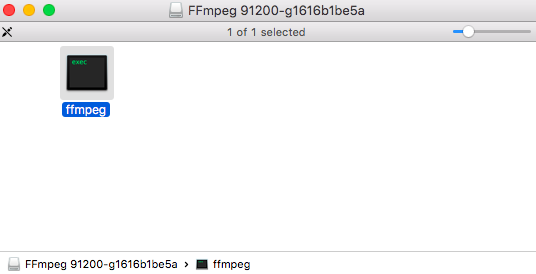 I must be close, is there a place where I now need to define a path for ffmpeg? I don't know how to do that, or what path to use. The problem is bash is looking for ffmpeg in directories list in the $PATH. Some of these directories are protected by SIP and therefore you would need to disable SIP to put the file in these directories. Alternatively, you can install it using Homebrew. Homebrew will install ffmpeg in a path not protected by SIP, but within the $PATH, more specifically it will install it under the /usr/local/bin directory. This can be done manually with manual commands (basically manually doing what homebrew does. For this approach check out @davids answer. But I would suggest homebrew for multiple reasons. Its much easier to use and quicker to install a large amount of tools. You can also update much faster. Homebrew also makes installing dependencies easier. Edit: Not sure why this is getting so many downvotes. I previously had a part of this answer with inaccurate information I have since changed it. I believe it is currently accurate. If you disagree you can comment below or edit it as needed. I have included the part about SIP because I think it is important to understand what restrictions there are regarding placement of commands and why there isn't just a single path for all commands. and all should be good to go. Disabling SIP not required. No need for homebrew or any other package handler to install a precompiled binary. You do need to read up on basic UNIX though. The terminal shell of macOS, as in Windows or Linux, is looking in the $PATH environment variable to locate binaries. You either have to put a copy of the binary in one of those directory (preferably /usr/local/bin as it is not SIP-protected) or add another directory in your $PATH environment variable. Not the answer you're looking for? Browse other questions tagged terminal install bash . Is there a way to turn on indicator that a directory item is a shell script in Terminal? Is there a way to immediately exit a hanging connection in Terminal? When installing an application is there any way to avoid any drag and drop?